BOTTOM CAPTION: Best April Fool’s Day…Ever! I don’t know which I like better, the original or your take. The shape of that skull…That face… The stuff of a horror comic artists dreams. Was Bill Ward work usually like that? William Hess Ward, known as Bill Ward, was an American cartoonist notable as a good girl artist and creator of the risqué comics character Torchy. I think this is a rather extreme example of Ward’s tendency to draw “Torchy” with that head shape. Not unique, though. 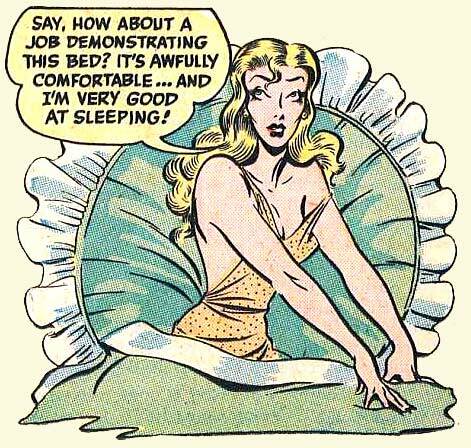 Torchy was a humorous feature and Ward drew her more cartoony than some of his other comic work. Ward’s work became even more cartoony and the women he drew became even more bizarre (and top heavy) later in his career when he was mostly drawing mild-to-raunchy gag illustrations for men’s magazines. That is probably what he’s best remembered for these days.